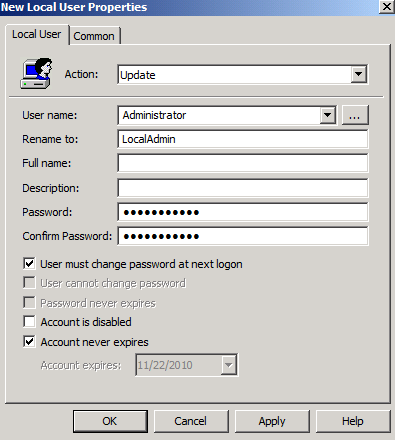 There are different ways to change the local Administator password on all domain computers at once, and some of them are explained in this DS forum thread: Change Local Administrator Password with group policy. Update: A new solution for managing local Administrator passwords is now available on MSDN at http://code.msdn.microsoft.com/Solution-for-management-of-ae44e789. This solution is a client side GPO extension (CSE) that is simple and scalable, amongst many other benefits. Using Group Policy Preferences to accomplish this is really easy. If you want to change the local Administator password on all domain computers at once, you might just edit the Default Domain Policy becasue that applies to all computers in the domain. Right-click Local Users and Groups, click New, and then Local User. In the New Local User Properties dialog box, for User Name, type Administrator. You can rename the Administrator account on every domain computer, as in this example, and you can specify the new password. 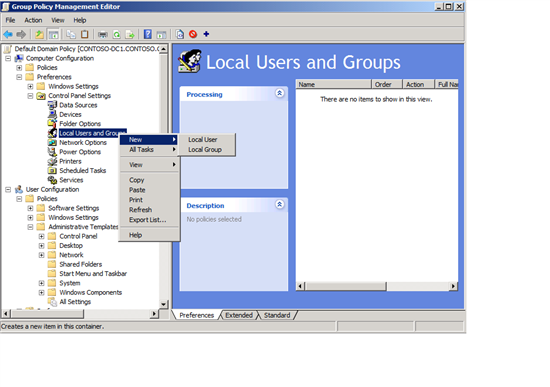 You can use Group Policy Preferences on computers running Windows XP SP2/SP3 (with KB943729 installed) and later. The forum thread covers logon script options too.